Welcome to King of Glory Lutheran Church! I’m delighted you’ve taken a moment to read about our congregation. We truly are a congregation that lives daily through our Mission Statement: As God’s people, graced by differences, nurtured by the Spirit, and gifted to serve, we invite and welcome all to grow in Faith. Come as you are: whether you’ve grown up in a church or never stepped inside the doors of one, we’d love to meet you. Come as you are: single, married, divorced, widowed, or partnered, God claims you and loves you. Come as you are: struggling with all the issues of life, celebrating milestones, or reminiscing your best years, there is a place for you here. King of Glory offers a variety of ministries and activities that you can connect with and make a difference. Whether you are a household of one or many, we have a place for you. Here you’ll discover group interactions and individual relationships, Bible study and community service, fellowship and friendship, even artistic expression or event management. Above all, we welcome you into a congregation built on the belief every person is God’s child. King of Glory is a safe environment of acceptance and respect. Pastor Ruth Ann Loughry was born in Cheyenne, WY, and baptized into the United Methodist denomination. She attended St. Olaf College in Northfield, MN, majoring in Music Education with a minor in English Education. Ruth Ann taught elementary school music for five years in Littleton, CO. Her seminary studies took place at Luther Seminary in St. Paul, MN, and Wartburg Seminary in Dubuque, IA. 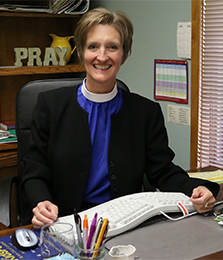 Ordained in 2002, she served three congregations as an Associate Pastor for 12 years in Pierre, SD, and Cherry Hills Village, CO, before coming to King of Glory. She delights in being present to and with God’s people at ordinary and significant milestones in life. Pastor Ruth Ann loves to be outside, walking, biking and looking for birds.